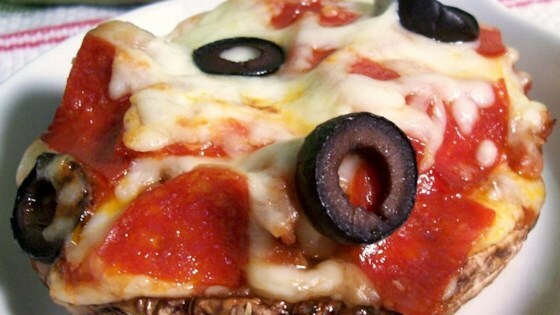 "A delicious recipe that substitutes a portobello mushroom for a pizza crust. Try using pesto sauce instead of spaghetti sauce, and experiment with your favorite pizza toppings." I thought this was OK but not great. I have to agree with the other reviewer, who said they are difficult to eat. So, I'll probably not eat again. Sorry! to avoid a watery mushroom, cook longer (30 min) and hotter (425), turning over once. Add toppings and broil until the cheese melts. Excellent! I marinated my mushroom in a bit of Italian dressing for a little extra flavor, and with a little cheese and tomato sauce, it was wonderful. I'll definitely use this recipe again.